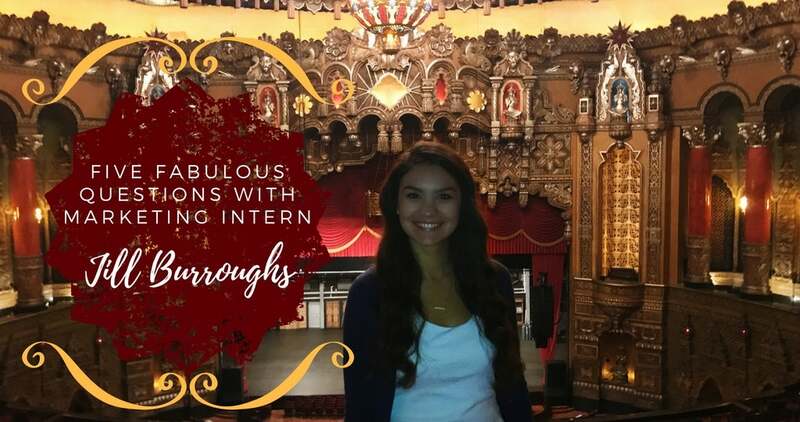 My name is Jill Burroughs and I am the fall 2017 Marketing Intern at the Fabulous Fox Theatre! I am a senior Public Relations major with a minor in Journalism at Missouri Baptist University. When I am not in class, I like to sing in a worship band, explore different coffee shops and enjoy time with my friends outside taking pictures for my Instagram and having a good time. For the past year, I have been the vice president of student government at my university. My goal is always to help be the link between the student body and the administration. This past summer, I had the opportunity to intern with the Fox with the sales internship. I enjoyed my experience working here and I am excited to be back! The Fox has always been a grand place to a kid who loved the world of theatre. Growing up, I took voice lessons and auditioned for any shows I could find locally. I loved being on stage and going through a transformation to tell a story. Technically, I have sang at the Fox, but it was Christmas caroling to the associates in the office. Although I did not perform on stage, I got to see my first show here at the Fox: A Christmas Carol. I loved the intricate design of the Fox and the quality of the show was none like I had seen before. My love for theatre began when I was very young so I do not remember the first show saw, but there is one that sticks out to me. I saw Singing in the Rain at the Muny. I had been familiar with the songs and I had seen the movie, but seeing it live was such a different experience. I was amazed by the energy of the actors and the talent. Most of all, I could not believe they made it rain on stage! It was a magical evening. I just missed it this past summer, but I would love to see The Lion King. I have yet to see it performed live. I grew up with the animated movie and I know all the songs but I hear the musical is amazing. If it comes back to the Fox, there is no way I am missing it again! I think this is going to be a great Broadway season. I feel like if I am in theatre and an American citizen, I have to say Hamilton but I am actually more excited about On Your Feet! It looks like such a fun and energized musical. I love hearing and learning about other cultures and languages. Also, I proudly know all the lyrics to Gloria Estefan’s song, Conga. I am excited to watch the story of Gloria and Emilio Estefan play out on the Fox stage. I grew up on southern Illinois close to St. Louis and it was easy to take it for granted. After going to school in St. Louis, I love the variety and life it has. There are beautiful parks and rustics buildings and everything full of character. One of my favorite things to do is discover coffee shops and St. Louis has a lot to offer.